Independent family-run business, Coles Funeral Directors, will be staging a beautiful rose petal release on Valentine’s Day 2018 to demonstrate their commitment to driving the Death Positive movement in Cardiff. The Death Positive movement focuses on the importance of open discussions on the reality of both one’s own death, and the death of others with a view to encouraging comfortable, honest, open, and curious conversation that ultimately enables all those involved to lead the life they want to live, and “appreciate the little things”. The display will include anonymous messages of ‘Things Left Unsaid’ to the deceased. Over the last few weeks the team at Coles has been collating the messages from members of Cardiff’s community and writing them anonymously on bio-degradable (dissolvable) paper. 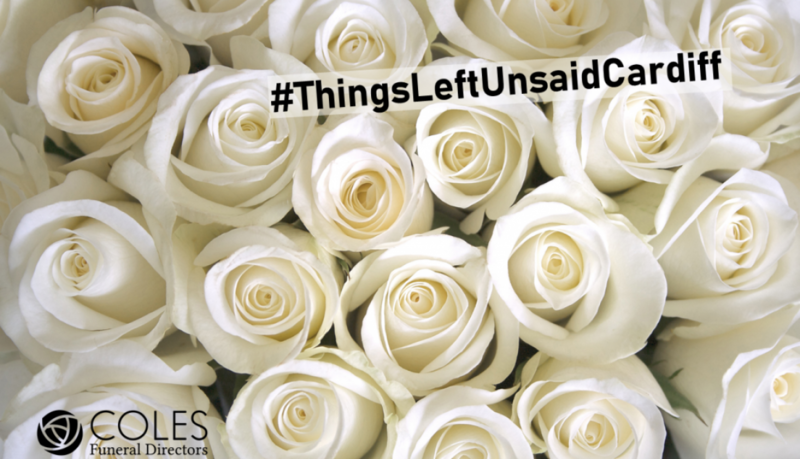 The messages will be painstakingly attached to the rose blooms, before they are set adrift downstream in a symbolic act of encouraging people to share how they feel and talk about the things that matter to them. “When we first launched this campaign, we considered staging a balloon release and looked into how we could do this responsibly with air-filled, hand-tied, bio-degradeable balloons. However, we had some feedback from Cardiff’s environmentalists that even these steps might have a detrimental impact on the surrounding wildlife. Being an independent, community-focussed business we took the feedback to heart – so we spoke to each of the people that had engaged with this campaign and pitched them the idea of a rose petal release instead. They loved it – and we’ve even received more #ThingsLeftUnsaidCardiff messages as a result! Coles Funeral Directors assures readers that there is still time to include a message in the release. Simply send them the details via social media or email using the #ThingsLeftUnsaidCardiff hashtag. With people from all walks of life, cultures and religions proud to call Cardiff home, Coles Funeral Directors is dedicated to serving this diverse community and delivering bespoke services to ensure each and every funeral we arrange is the perfect reflection of the life of the deceased. Winner of Business of the Year 2017 and the only funeral business in Wales to have achieved endorsement from independent accreditors, The Good Funeral Guide, Coles’ innovative business is at the forefront of the funeral industry in South Wales. Delivering traditional religious ceremonies, woodland and eco funerals, as well as all types of humanist and celebration of life services, Coles Funeral Directors also provides tailored pre-planning and pre-paid funeral plans and won Golden Charter’s Funeral Planner of the Year two-years running for its ‘pre-need’ work. Professional, independent and family-run, Coles Funeral Directors is regulated by the National Association of Funeral Directors and is commitment to raising standards in the funeral and death care industry in Cardiff and the surrounding areas. “The Death Positive (or Death Positivity) Movement is represented by the general (and growing) movement toward opening platforms for discussion about the inevitability of death and dying. The movement focuses on the importance of encouraging open discussions on the reality of both our own death, and the death of others. This includes the creation of platforms and spaces where such discussions can transpire in a comfortable, honest, open, and curious environment; where individuals may come together with different perspectives and exchange them with one another. It also has a very practical goal of teaching us how to speak to others (i.e. our parents and partners) about their end-of-life wishes, as well as our own.